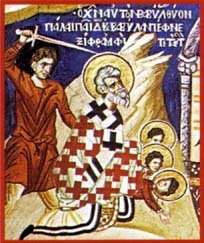 The Hieromartyr Babylas was the Bishop of Antioch from 237 to 253. His feast day is September 4. He was martyred for his faith in Christ together with the three youths Urban, Prilidian, Epolonius and their mother Christodoula, under the emperor Decius (249-251). The most common version notes that during a visit to Antioch by the emperor Decius as part of an arranged a festival to the pagan gods, Decius attempted to witness a Divine Liturgy served by Babylas. Babylas barred the emperor from entering the church, for which the emperor had the church burned. After Babylas declared the emperor unworthy because he desecrated God's sanctuary, Decius ordered Babylas to worship the pagan idols or face execution. Convinced that Babylas would remain true to his faith, Decius ordered Babylas to be placed into heavy chains. The chains, Babylas told the emperor, were as important to him as the imperial crown was to the emperor, suffering for Christ was as desirable to him as imperial power was to the emperor, and death for the Immortal King was as precious to him as life to Decius. The emperor tried in all sorts of ways to entice the youths and their mother Christodoula to renounce Christ, but in vain. Then, in a rage, he ordered each of them to be whipped with a number of blows corresponding to their age. The first received twelve blows, the second, ten, and the third, seven. Dismissing the mother and children, the torturer again summoned the bishop, telling him that the children had renounced Christ. However, the holy bishop did not believe the lie. The emperor commanded all the martyrs be tied to a tree and burned with fire. Seeing the stoic bravery of the saints, the emperor finally condemned them to be beheaded with the sword in the year 253. ↑ St. Chrys. de St. Bab, c, Gentes, tom. i. This page was last edited on September 4, 2014, at 05:22. This page has been accessed 16,154 times.